« What’s The Best Age to Start Baby Massage Classes? If you’re feeling pins and needles, numbness or pain in the hands, and it’s contributing to one of the many reasons pregnancy keeps you up at night – don’t despair! This uncomfortable part of pregnancy will be taken care of, all thanks to the variety of health services and support available for treating Carpal Tunnel Syndrome (CTS) in pregnancy. Carpal Tunnel Syndrome is characterised by the compression of the median nerve running through the bones of the wrist and is typically aggravated by the pressure associated with an increase in fluid retention in the body. CTS can cause a range of different symptoms, which can be mildly uncomfortable for some, yet severely painful for others. The severity of this condition is usually activity-related, affecting those who engage in activities (sport or occupational) that require repetitive use hands and wrists, such as typing, construction, gardening or playing an instrument. Symptoms in the palm and fingers may include: pain, numbness, tingling, burning, weakness and temperature sensitivities. Though some may experience these symptoms from their hands right up to their elbow and even coexist other repetitive stress conditions, such as medial epicondylitis (Golfer’s elbow). During pregnancy, fluid retention is a factor that increases the risk of women getting CTS. Although swelling is considered a typical symptom in pregnancy, it’s always best to explain your concerns to your prenatal care provider. If CTS is left untreated for an extended period, it can potentially lead to permanent nerve damage and muscle wastage. A medical professional (eg. Doctor, Physiotherapist, Osteopath, Chiropractor) will confirm CTS during pregnancy based on the presenting symptoms and clinical assessment. They may refer to other health care professionals and pregnancy specialists for further assessment and management of the condition – including swelling management, ergonomic advice and prescribing exercises and wrist splinting. Massage therapy can assist in treating the symptoms caused by the compressed median nerve in the wrist by addressing the surrounding soft tissues which typically tend to tighten with increased swelling and may also refer pain and discomfort to the neck and shoulder muscles. Cold packs applied to hands and forearms may be helpful in temporarily reducing CTS symptoms. We do appreciate that this is difficult to apply during the work day, and may be better suited to application in the evenings whilst siting watching television, for example. Contrast bathing may also offer some relief for Carpal Tunnel Syndrome in pregnancy. This is carried out by setting up two bowls; One with ice cold water and the other with water as hot as you are comfortable with. Submerge hand and wrist into one bowl and leave for approximately 30 seconds. Remove and place hand and wrist into alternative bowl of water for 30 seconds. Continue to alternate between the cold and hot water bowls for approximately 3 minutes. CTS will often subside in the days and weeks after birth. However for some new mums the numbness, tingling and weakness in the hands/forearms may continue with the increased activity due to holding and supporting their baby for long periods. Pregnancy Massage Specialists may help to alleviate the discomfort associated with CTS in pregnancy by using specific techniques that focus on decreasing muscular tension in the forearms and hands, and gently encourage the movement of the fluid away from this area of the body in order to reduce the pressure on the median nerve found at the wrist. 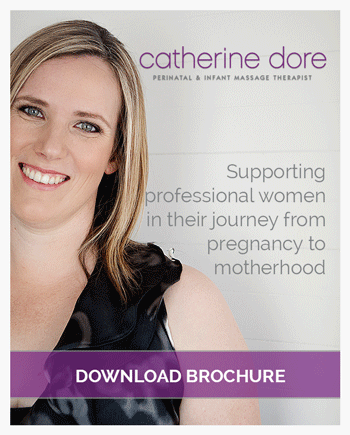 The blog article was written by Pregnancy Massage Specialist, Koko Toyer @ Catherine Dore – Perinatal & Infant Massage.